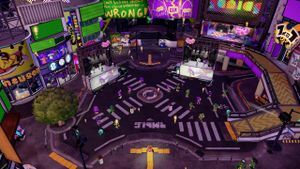 For the hub world of Splatoon 2, see Inkopolis Square. Inkopolis Plaza is the main hub of Splatoon and the heart of Inkopolis. From here players can access various modes and shops, as well as interact with other players' Inklings via Miiverse. The Plaza is roughly square-shaped, with a large sidewalk. At the far north side is Inkopolis Tower which houses the Battle Lobby, allowing the player to access online battles. To the south is a train station just outside the bounds of the accessible area. Exiting a mode causes the player to stand in the middle of the Plaza on a road marking that resembles a spawn point. If the player is somehow splatted in the Plaza due to either glitching or hacking, the player respawns from the road marking. On the west side of the Plaza is Booyah Base, a small set of shops in which the player can buy items, including weapons at Ammo Knights, headgear at Cooler Heads, clothing at Jelly Fresh, and shoes at Shrimp Kicks. Each shop has a charismatic shopkeeper representing a different type of marine life. These include Sheldon the horseshoe crab, Annie the sea anemone (and Moe the clown fish), Jelonzo the jellyfish, and Crusty Sean the shrimp. In the northeast corner is a grated manhole from which Octo Valley can be accessed. Next to it is a Café and above it is a small catwalk, which leads to the Battle Dojo and the Inkopolis News Studio. On the eastern side of the Plaza is Spyke's alleyway, and at the southeast corner is the amiibo box. After playing with others online, their Inklings will temporarily appear in the Plaza, first in front of Inkopolis Tower, then scattered around the rest of the area. The player can see their name, Level, rank, and the weapon and gear that they had equipped when the player saw them last. Gear can be ordered from here via Spyke. Inkopolis Plaza also features two large statues: a tanuki on top of the Squid Sisters' studio and a fox on Booyah Base. The animals depicted by these statues were involved the second Japanese Splatfest, Maruchan Red Fox vs. Green Tanuki. After completing the tutorial in a nearby area, the player Super Jumps to Inkopolis Plaza. The first time the player watches Inkopolis News, they learn that sometime before the events of the game, the Great Zapfish that powers the city had been stolen from Inkopolis Tower. The player then follows Cap'n Cuttlefish through a manhole in the plaza, to an area known as Octo Valley. The player is recruited as Agent 3 of the New Squidbeak Splatoon and completes levels to rescue the Great Zapfish and return it to the Plaza. After completing the single player campaign, the Great Zapfish can be found resting on the Inkopolis Tower. The new main hub is Inkopolis Square, which is stated in The Art of Splatoon 2 to be two train stations away from the Plaza, or a 20 minute walk. The book also reveals that about half a year after the events of Splatoon, redevelopments in Inkopolis Square made it very popular, causing it to become the new hotspot for the Inklings and the popularity of the Plaza to fall by the events of Splatoon 2. Due to this sudden decline in popularity, several residents of the Plaza moved to the Square. The Great Zapfish moved to the Square, and is perched on the Deca Tower. According to Sunken Scroll 3, Sheldon shut down the original Ammo Knights shop in the Plaza, to open a new one in the Square, while the Squid Sisters Stories detail how Crusty Sean had recently quit his long-running job as store manager of Shrimp Kicks in the Plaza, to open his own independent business in the Square. Callie states that Annie became flustered whenever Cooler Heads was busy, and so set up the online Splatnet Gear Shop. Judd now resides outside Deca Tower instead of Inkopolis Tower, while Spyke could afford to move away, and can be found in the Square in a café with a laptop. During a Splatfest, it is nighttime in Inkopolis Plaza. Decorated with colored lights and lanterns, small team-colored sparks rising from the ground, and neon signs and fireworks with Miiverse posts, it takes on a much more festive tone. In the center are two trucks outfitted with stage equipment upon which the Squid Sisters perform a song unique to Splatfests which serves as the background music in the Plaza and, to a lesser extent, the Shooting Range. Jellyfish and Inklings alike are gathered in front of the trucks, wearing Splatfest Tees and dancing to the music. Since players must wear their Splatfest Tees, Jelonzo will have special dialogue informing them that they cannot equip new clothing bought. 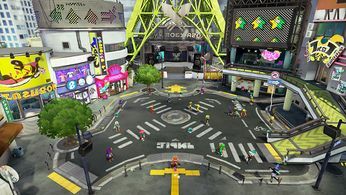 The layout and design of Inkopolis are based on the city of Shibuya in Tokyo, Japan. As stated in a developers' interview, the fox and tanuki statues above Inkopolis Plaza are leftovers from when Splatoon's main characters were to be rabbits. The central theme to the character design was originally going to be Japanese folklore, including such animals as cats, foxes, and tanuki - hence the statues. It is unknown how the aquatic inhabitants of Splatoon's world came up with the designs for them, but they were nonetheless intended to show respect for the past. According to The Art of Splatoon, there is a ceremony once a year to clean the fox and tanuki statues. Inklings are said to not care, but many volunteer as they get to climb around the plaza. While announcing the Retro vs. Modern Splatfest, Marina labels the Plaza a ghost town, though Pearl still returns to it to play games on the Arcade Machine. The arena of the Tide Goes Out boss mission has road markings that are based on the markings in the center of Inkopolis Plaza. There exists artwork of Callie and Marie sitting by a table, which is appears on the TV board behind the TV screen in Inkopolis Plaza where the Inkopolis News is aired. It is impossible to see this image without hacking. 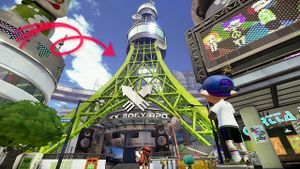 It is possible to see the Inkopolis Tower from Inkopolis Square. A close-up of Inkopolis Tower. One of six Vending Machines in Inkopolis Plaza. Inkopolis Plaza during a Splatfest. Inklings dancing in Inkopolis Plaza during a Splatfest. Inkopolis Tower and the sky above decorated with Miiverse posts during the Roller Coasters vs. Water Slides Splatfest. A train can be seen going past Inkopolis Tower on an elevated railway. This page has been accessed 36,481 times.